The nearest light pole in this shot at South Albany High will be replaced with a taller one carrying the stadium lights plus an antenna. Verizon Wireless customers in the neighborhoods around South and West Albany high schools can look forward to improved cell phone service now that the city planning staff has approved plans for new towers. 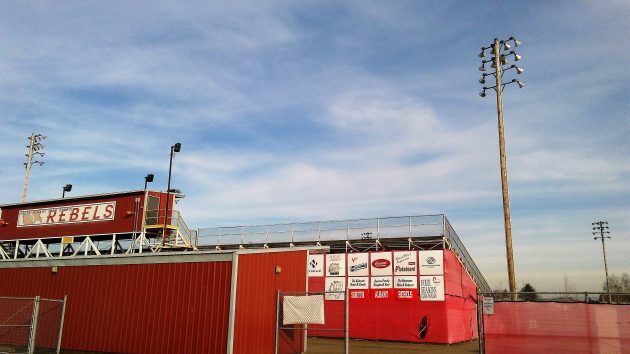 At both schools, Verizon’s planned steel monopoles will replace existing wooden poles that hold stadium lights. The steel replacements will be slightly higher and hold the same lights in addition to antennas for the wireless system. The Albany Community Development Department gave its tentative approval to conditional use permits for both projects. At West, the approval became final on March 3 when no one requested a public hearing. In the case of South, three nearby residents had submitted questions or objections to the antenna. Unless they ask for a hearing, that decision will become final at 5 p.m. March 20. The residents raised concerns including that the South tower would be unsightly and possibly unstable because, before the school was built in 1970 there were wetlands on the site. They also worried that radio frequencies might have health effects. The company responded that the pole would look little different from what’s there, that the strength of radio waves from the antenna would be well below safety limits established by the government, and that the pole would be built following geotechnical and environmental studies. Verizon has been negotiating with the Greater Albany School District to allow the projects. GAPS business director Russ Allen told me that no agreement had yet been concluded. Earlier, he said Verizon would pay the district about $1,400 a month in lease fees for each tower, and the agreement would probably be for 20 years. At West, the light pole to be replaced, near the bleachers at the baseball field, is 78 feet-6 inches tall . The replacement steel pole will be 90 feet tall. At South an 80-foot steel pole will replace a 71-foot, 6-inch wooden mast near the football field stands. In its submission supporting the applications for conditional use permits, Verizon said the locations were chosen in order to improve cell phone service and meet increasing volumes of cell phone traffic. If other carriers want to install antennas on the same poles, city rules require that they be allowed to do so.